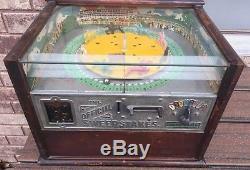 Horse race gambling machine from the 1930s. The graphics and play field are in good condition. 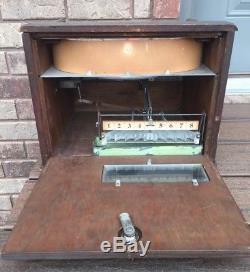 All original parts including the coin box, backdoor, and lock. The key is newly cut by a locksmith. 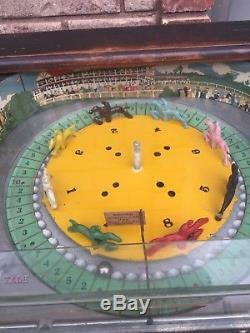 A steel ball rotates around the center as the horses spin resulting in noise and visual appeal as the horses race. 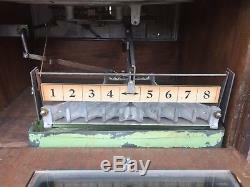 Paper card is still present stating: WINNER Closest nose to left of line. 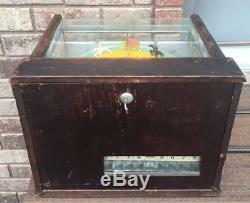 The TELL TALE rod is loose in the play field and it needs to be reattached to the chain hanging down inside the case. 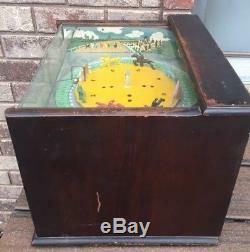 This is a nice original example of a neat horse race machine. 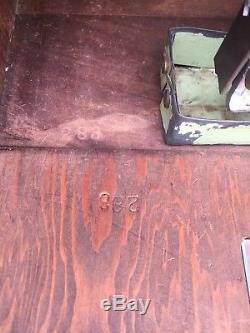 The serial number is stamped into the backdoor and case #283. Call or text for best price. 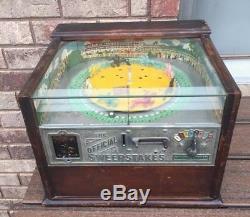 The item "Antique Rockola Sweepstakes Horse Race Machine" is in sale since Sunday, September 23, 2018. 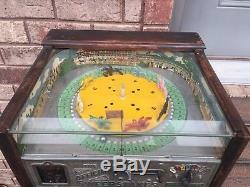 This item is in the category "Collectibles\Casino\Trade Stimulators". 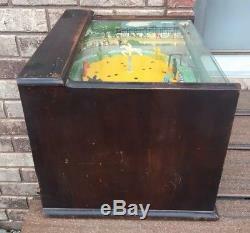 The seller is "coinmachines" and is located in Northville, South Dakota. This item can be shipped to United States, Canada, United Kingdom, Denmark, Romania, Slovakia, Bulgaria, Czech republic, Finland, Hungary, Latvia, Lithuania, Malta, Estonia, Australia, Greece, Portugal, Cyprus, Slovenia, Japan, China, Sweden, South Korea, Indonesia, Thailand, Belgium, France, Hong Kong, Ireland, Netherlands, Poland, Spain, Italy, Germany, Austria, Israel, Mexico, New Zealand, Singapore, Switzerland, Norway, Saudi arabia, Ukraine, United arab emirates, Qatar, Kuwait, Bahrain, Croatia, Malaysia, Colombia, Panama, Jamaica.